Home Costs > How Much Does Repointing a Chimney Cost? How Much Does Repointing a Chimney Cost? Re-pointing a chimney, often referred to as tuckpointing, is when the external parts of the mortar joints of a chimney are renewed. Over time, usually about 20 years or so, decay and the weather will cause a void in the joints of masonry units that allows an ingress of water, which can lead to the weakening of the chimney. The term “pointing” refers to the finished cement/mortar that lies between the brick and the chimney, and if you’re spotting loose, crumbling mortar around your chimney, then it’s probably time to have this job done. The price for re-pointing of a chimney depends on the rate the company charges, the amount of damage that needs to be fixed, the size of the chimney, how the chimney can be accessed and geographical location. If the chimney was much higher than average, then it can affect the costs. On average, re-pointing a chimney can cost about $350 to $550 per 20 square feet. The prices will tend to be cheaper where jobs won’t require scaffolding, which is usually with jobs that are less than five to seven feet tall. According to DIY or Not, a mason can charge about $778 for a good sized chimney, about 150 square feet, or if you want to do it on your own, then the costs will be about $175 for the materials and the scaffolding needed for the job. According to the website, close to 80 percent recommend hiring a professional when doing the job since inspecting and repairing a chimney at high heights can be dangerous. One person answered this question on Angie’s List and said his in-laws had the work done and were charged $150 to $250 for the mortar work and another $80 to $150 for the cap. This was for about four vertical feet of crowning, a new crown and a crown in a lower cost of living area. If the entire chimney needed to be repointed, however, the costs could easily be in the $500 to $700. Before the contractor considers repointing the chimney, he or she will first inspect the chimney pot, the top of the chimney, the condition of the brickwork and the condition of the chimney around the base. If any of these parts are in bad condition, they may need to make the necessary repairs before the re-pointing job even starts. These repairs, depending on the extent of the damage, can cost much more than the quote mentioned above. During the process, a contractor will first repair any mortar or loose bricks that need to be fixed on the chimney if any of them are in bad shape. The first thing that they will do is remove all of the loose joints, and once removed, the joints will be grounded with a tool such as a chisel to reach the surface. The surface will then be brushed out with water, flushed out and a new mortar will be applied. This mortar will have a bonding agent that will allow the new brick to bond appropriately. The average Mason can take, on average, four hours for every 20 square feet they work with. The average medium-sized chimney will take one to two days to complete. Other repairs may be noted during a common re-pointing job. For example, if bricks were broken, repairing the cracked brick with replacements could cost $5 to $12 per square feet. If the chimney has deteriorated more than average, then this could add another $5 to $10 per square foot, depending on the complexity of the job. 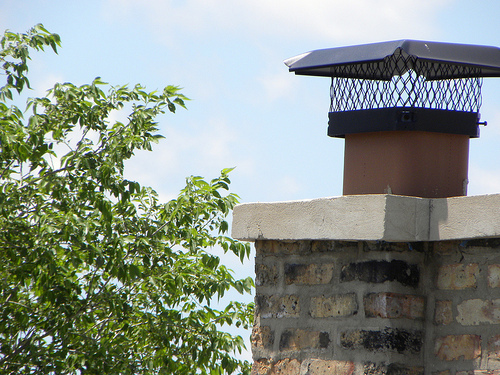 Since a chimney cap can wear down over time, the mason may recommend replacing it. If this were the case, this could be an additional $300 to $600 more for the cap. When hiring any professional, always make sure you get at least three quotes. Most reputable professionals will be more than happy to come out and offer a free quote. If you don’t have the time do to find quotes, consider using HomeAdvisor.com — it’s free. Here, you describe your job and contractors, who are licensed and insured, will contact you with a ballpark estimate. The average costs of repointing is 12.00 to 25. 00 a square foot depending on the hardness of the mortar and time it takes to set up the scaffold. 410.00 and they didn’t finish the job. they was charging me 82 dollar a pound for the mortor.